In hearing a challenge to Arizona’s proof of citizenship law for voter registration, the Justices will decide what powers Congress has to protect the right to vote. Three weeks after hearing a challenge to the heart of the Voting Rights Act, the Supreme Court will decide another important voting rights case following oral arguments today in Arizona v. The Inter Tribal Council of Arizona. Supporters of Prop 200 claim the proof of citizenship requirement is needed to stop voter registration fraud. But as the appeals court found, “Arizona has not provided persuasive evidence that voter fraud in registration procedures is a significant problem in Arizona; moreover, the NVRA includes safeguards addressing voter fraud.” Adds Nina Perales, vice president of litigation at MALDEF: “Nobody has ever been prosecuted for using the federal form to register to vote as a non-citizen.” There have been only seven cases of alleged election fraud in Arizona since 2000, according to an exhaustive study by News21, and the two alleged instances of non-citizens voting were dismissed. Nonetheless, Arizona’s Prop 200 has served as a model for other states looking to pass new voting restrictions. (The conservative lobbying group ALEC recommended the bill to state legislatures in 2008.) Three states—Alabama, Kansas and Tennessee—adopted proof of citizenship laws for voter registration since the 2010 election and legislation was introduced in nine other states (Colorado, Connecticut, Maine, Massachusetts, New Hampshire, Nevada, Oregon, South Carolina and Texas.) Kansas Secretary of State Kris Kobach claimed in 2011 that sixty-seven non-citizens had illegally registered, out of 1.7 million on the state’s voter rolls, but “was unable to identify a single instance of a non-citizen illegally casting a vote, or any successful prosecution for voter fraud in the state,” according to the Brennan Center. Why would a non-citizen, who presumably is in the United States to work, risk deportation and imprisonment in order to cast a ballot? Kobach once suggested in a radio interview that perhaps their coyote was paying them to vote, which defies all logic. In hearing the Arizona case, the Supreme Court will once again decide what powers Congress has to protect the right to vote. In the recent challenge to the Voting Rights Act, the Court’s conservative majority seemed skeptical of the steps Congress could take the remedy past and present voting discrimination. Will they take a similarly dim view of Congressional authority again? The appeals court found that the Elections Clause of the Constitution—Article I, Section 4—gives Congress the ability to regulate federal elections, contrary to Arizona’s submission. The Supreme Court has recognized this repeatedly, most recently in the 1997 case Foster v. Love. “The Constitution gives Congress the ultimate authority in setting rules for federal elections,” says Perales. Unless, of course, the justices maintain that registering to vote, like the Voting Rights Act, is just another racial entitlement. UPDATE: The lawyers opposing Prop 200 seemed pleased with how the oral arguments proceeded. “Based on the discussion in the courtroom this morning, we are confident,” said Nina Perales. “The argument, from our perspective, went well,” said Jon Greenbaum of the Lawyers’ Committee for Civil Rights. Justice Scalia, perhaps not surprisingly, led the charge in defense of Prop 200, while Justice Sotomayor said the law clearly violated the NVRA. 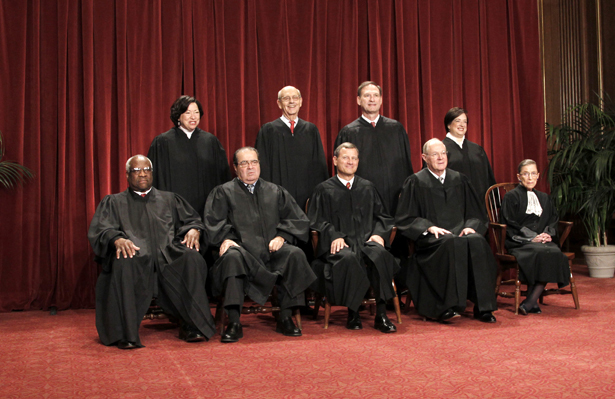 “Some of us do believe in legislative history,” said Sotomayor. “Some of my colleagues don’t.” In response, Scalia pointed at himself. Justice Kennedy, the court’s swing vote, “seemed to advocate for both sides of the case,” reported Ryan Reilly of The Huffington Post. Kennedy argued that the federal form “is not worth very much” if Arizona could simply impose additional requirements on top of it, but later said that states had a “vital interest” in federal elections. As Congress was honoring Rosa Parks late last month, conservative Supreme Court justices were discussing a change to the Voting Rights Act that could undo many civil rights successes.